I love wide legged pants and own a few pairs. I am neither tall or skinny, but have found that if styled well they can still be flattering. My favorite tops to wear with them are a cropped top (gives the same visual effect as tucking) or a wrap top that helps define the waist. I think they look especially cute with fun sneakers. I hope this is not a quick trend but stays around for a while. I am tired of skinny everything. I have tried on a few pair of wide leg pants and so far they look really bad on me. I know I have worn them in the past so maybe it is a matter of my eye adjusting. I will keep trying but not so sure I can go back. I like your looks here so maybe in the spring when I am back into crops I will find some I like. Experimented with a pair of wide-leg crops with a paper-bag waist last summer, and LOVED them. (Too big now) It hasn’t occurred to me to try for a winter pair, but I like all of the above looks. I would swap the shiny bright red of #3 for a soft burgundy though; I understand juxtaposition but to me the wonder woman vibe doesn’t connect with the casual luxe chic of the rest of the outfit. I personally don’t wear wide crops. But I really like the second outfit in red very, very elegant! Of course, low contrast, column of color, long jacket the white booties kind of disappear – but very pretty. I do like narrow crops with matching booties – but I carry my height in my legs and I like to show it off – narrow legs just do that better. But all very elegant and I will admire this absolutely on others!! Refreshing silhouette! I have taken wide leg pants and crops off my personal list of options, though I enjoy the look on others. Achieving JFE here is too much effort when pants are wide legged. Will apply your inspiration to cropped flares (with narrower thighs) or full length flares. I don’t want to sound crabby, but I am kind of bummed that cropped styles continue to rule retail. I looked at the Madewell site and could not find a single pair of full-length jeans. I just don’t care much for cropped lengths on me — especially with a wide hem. The contrast in proportions with my narrow ankles just seem to emphasize that I have wide hips/legs, and the additional high rise trend doesn’t help flattery for me either. I *can* wear them if I style very carefully, but that’s just usually too much work these days. I’ll sit these looks out and enjoy on others, and cling to my collection of full-length pants, waiting patiently for those lengths to come back around. I am not ready to move away from skinny bottoms. I feel awkward in wide legs, like there is too much moving around when I walk. And selecting the right footwear just tires me out. But I can certainly appreciate them on others. I love wide legged cropped pants and have added several to my wardrobe recently. I like all these looks and have worn my version of #1 and #3 recently. I have almost all the pieces for #4 in my wardrobe (my sweater is eggplant and is almost identical to the model’s). I do like a cropped sweater or jacket with the pants. Then I am not concerned about the tucking. This looks so fresh to me! I have a two pairs of old cropped wide legs from the Gap that I typically wear during the summer. They aren’t high rise but I’m tempted to give this a try. The footwear can be tricky–but I think my sock booties might do the trick to winterize the crops. 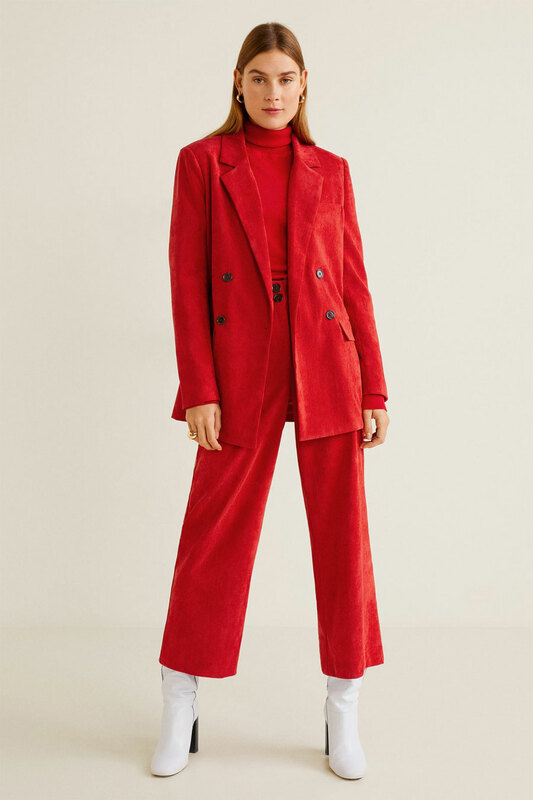 I dislike these intensely when paired with skinny-heeled boots — to me, the wide silhouette needs to be grounded with a more solid base, such as in the final outfit. And like Janet, I’m feeling pretty over this look. 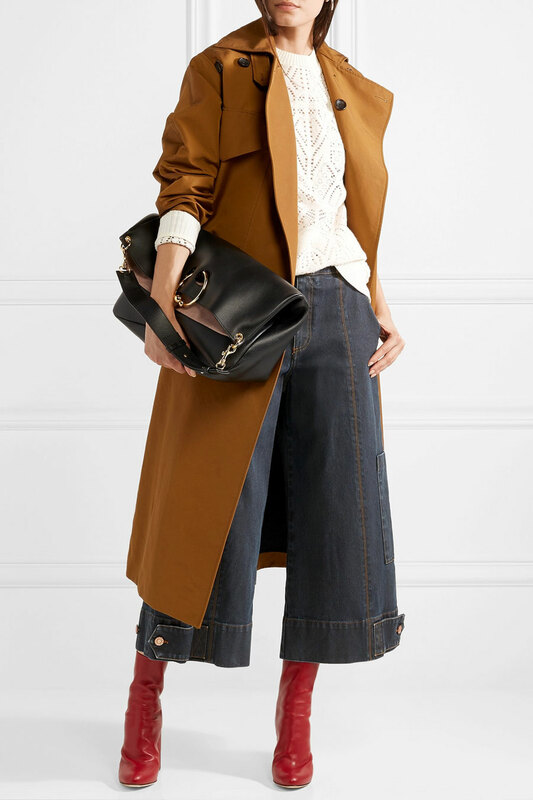 I can’t see myself getting any of these pants, but I love the aesthetic of the last look, especially the juxtaposition of fur collar with boots and socks. I agree with Janet. Please just give me a pair of classic dark blue jeans that are full length. I will ride out this lovely trend. I don’t like to showcase my wide feet. I don’t mind them, but it is very hard to find the chic shoes/boots required for the looks above with a wide foot! I went on a search for this silhouette this summer and have been wearing them in a mid rinse denim. For me the high waist can be tricky (I’m thick in the waist), so I’m working with partial tucks. I like all of the above looks, the Earthy Super Hero resonates the most b/c of the colors. I’m thinking about getting a pair of Doc Martens for the lug sole. Thanks for featuring these looks today, Angie! I wore a version of #1 a couple of weeks ago, with a cropped jacket and leopard-print lightweight scarf. The hem of my sweater is short with a welt, ending at the top of my hip bone, so I wore it over the pant waistband. The hem of my pants end mid-calf and I wore them with black tights underneath. Shoes: 3″ high, brown and grey-green Clark’s Indigo Mary Janes that have a 1.5″ brown block heel. (Sorry no photo…I don’t have a full-length mirror at home!) I like wide pants with a chunkier shoe too. I like the look because very few people in the office wear it, so it looks different even though it’s been around for a while. I love these looks and I wear wide-leg cropped! But I have to say, I have not gone beyond my wide-leg jeans and two lighter pairs of pants for warmer months, because they are simply impractical for my wintry climate. I walked the dog in the jeans last week and the wind was whipping up my pant legs! There are reasons besides stubbornness that those of us in wintry places are forever devoted to the skinny silhouette… because we can tuck them into our boots! I guess if I worked in an office and only had to go from car to indoors I might have a few winter pairs, because I really do love the look. Nice to see some practical-for-winter stylings over tall boots. Rarely, it’s been dry enough this year to actually do this look without worrying about slushy splatter. I do love these proportions on others but they are definitely a challenge on me. I try on the odd pair of wide legs in store without much hope and so far not much success, for similar reasons as Janet. It goes beyond “not conventionally flattering” into the realm of ‘ridiculous’. Combined with the climate stuff, I doubt I will ever rock this fun look in winter. Glad there are some wide crop fans. I have one pair I got four years ago and I love them. Molly Mac, YES. Cropped tops are fab to wear with wide crops when you don’t like to tuck or semi tuck. The trend has been around for years, and I don’t see it going anywhere. Rest assured. Robin F, it might be the length. Try a column of colour. Sonce, sure. Making the outfit your own is what it’s all about. I like your burgundy sub. Eliza, cropped flares are as fab. Nice sub. Janet, you’re right. We need some full length options that aren’t flares! I think cropped styles continue to persist to showcase trendy footwear. Remember that you do wear cropped styles when you showcase your own KILLER footwear collection by rolling hems. Ramona, and your strategy sounds good. Style Fan, you wear cropped pants well. Maybe you need a black pair. Kellygirl, YES. Try the wide crops with your sock boots. April, interesting. I like the grounding effect of a thicker heel with wide crops too. Cjh, I can see you rock the style. Quietgirl, we can help you find wide footwear on the forum if you like. Kim, that sounds fab. I like a semi-tuck too. Liking the sound of the Docs. Blue Jay, your outfit sounds fab. And get thee a full length mirror please! Lesley, that’s ample variety. I have ONE pair. And YES to tapered jeans being THE most practical style in bad weather. There is no substitute. I love this look. My fave is the last one, with the combat boots. But, I’d switch out the embellished sweater. Maybe a plain turtleneck and long necklace. I had a pair of these a few years ago and I enjoyed the occasional outfit with them. I’m not sure I’ll try this trend again. Figuring out the right shoes was always an issue and I’m not sure I want to deal with it again. They look great on others though. I am looking forward to trying some of these outfit ideas soon. I wore my wide crops a lot last summer and fall but have only used full length pants with boots and booties this winter. I see outfit creation sessions using booties. The 4th outfit with lots of texture is my favorite. I can easily do black, but may try it in white or even earth tones. Fun in the closet! I enjoy wearing my one pair of wide crops, and hope to continue getting lots of wear out of them. I love the FEEL of wearing them. Angie, I like rolled hems because they are on narrower-legged (straight or skinny-ish) pants and jeans, which creates more of a streamlined look. I suppose that’s my version of cropped. Cropped flares feel very different to me — much less flattering. This is one of those looks I like in theory, but when I try it on myself, it’s disappointing. I have a long torso and short inseam, so I struggle with most cropped pants, especially wide ones (although the jeans in #3 are pretty fantastic). I’ll sit this trend out as well and enjoy it on others. I’ve been wearing my wide crops a lot this winter, and am toying with adding another pair. The last two looks both appeal to me, especially the color combination in the earthy one! It’s not for me but I think we will see lots more of this come summer. They haven’t been JFE in the past, and cropping and tucking are out of the question, but I might try them in a column of color. I love this, Angie. I have a pair of jeans and a pair of black pants, but sadly the black pants are getting worn out and I might have to replace them soon. I am loving the outfits with the long coats.Great silhouette, easy to pull off. I think a long trench is in my future, Angie! I would love one in that delicious toffee colour. I love this look! I would happily wear the first two versions. Ankle length and cropped jeans and pants are my thing. I especially love a cropped flare. Angie…..I’d love to do version #2 for Valentines Day but my red cropped pant is a linen blend. I don’t feel that they look especially summery but would that be a faux pas. I would wear them with a red sweater and a black bootie. I had two pairs from 3 or 4 years ago when it was a fringe trend. I enjoyed wearing them with tucked tops and a topper and fun shoes. However, after awhile I tired of the look and have not worn them in maybe 2 years. I have mixed feelings about them due to my curvy shape and am careful to style them in a way that doesn’t make me look more “round” and stumpy. I wish I could find a good cropped top – never could find one. Like Janet I am longing for full length pants after many years of cropped and ankle skinny pants ;-). I do like the look on others. I love all of these looks, but especially #3. Thank you for the inspiration! I like wide crops, but not too wide, and happily wear them in the summer. During the winter I much prefer full length pants with socks for warmth. I cheated a little by getting the “long” length (27″) because I thought I might like to cut off the distressed raw hem at some point (I prefer raw hems that are neatly fringed). I’ve always loved a wide crop, much preferable on me that “baggy” jeans, also a current trend–on me they just look like they don’t fit. Lots of love and thoughts on wide crops. I like it! Wendy, I like your subs. T-necks look fab with long statement pendants. Very ‘70s. Sara L, maybe just for Spring/Summer? Suz, #3 made me think of you. Joy, looking forward to seeing what you come up with. Anne, and you wear them with the best of them. Nemosmom, high waisted wide crops were made for long torsos. Lengthen the leg line with a semi-tuck. Taylor, how about some VERY streamlined wide crops? MsMary, do you still wear your CM culottes? Barbara Diane, there you go. Dianna, hope you find a replacement soon. Rachy, and we can keep it that way. Smittie, you would wear a long trench coat often, I bet. I love that shade of toffee. Marilyn, personally, I like linen best in high Summer. It’s not a faux pas though. Try on the outfit you have in your head and see if you like it. Catnip, I wear mine in the Summer too. mtnsofthemoon, YES. We need to see more full length pants with tapered legs. The industry is cropped-crazy. Joanna, those look great. And in white! I have summer and winter ones and enjoy them both. The plaid winter ones I like with tall boots the best. The summer pair have been worn with sandals – going to try oxfords and heels too. As a short waisted tall curvy person I have to be careful not to look too shirt in the torso. Tucking or shorter tops both work. Coats is my challenge – I don’t have the right one – so I just make do which limits them to milder days. I like #1 the most, except the bare patch of leg. Id prefer filling the gap with taller boots. I havent bought any wide crops, as I hardly wear my skinny ones, though I tried some flowy ones and liked them. But my sensible side reminded me our temps are 90s and humid or 30s and below, and barely anything in between. Love these looks, esp. your #1 and #2. Recently looked at photos of myself from 1983 where I wore similar looks! Angie, I believe I saw some VERY streamlined wide crops of a denim version today in a boutique window . I really liked those . I would do those :). When I have some time I will go back and try these on! Sal, you rock your wide crops. I've found that long tailored coats are best over wide crops – or short fitted jackets for structure. Suntiger, you can wear tights and tall boots under wide crops for warmth. The Cat, YES. That's '70s carry over into the early '80s, and fabulous. Taylor, YAY. That's what I'm talking about. Please report back. Great with your narrow tailored boots – and peep-toe booties. This is not a pant length that feels like it works for me. Feels a little frumpy on my shorter height and curvy shape. But of these selections my fave is #3. I like the proportion of the longer coats. Late to the party, but I do love the first styling particularly. Until March, I’m hanging out in the midwest with full length pants, but Like the movement in wide crops. Since I’m moving all the time and often playing guitar and drums on the floor, a soft version of this pants might be my work skirt. These outfits all look great so I pulled out my wide leg pants to try them. I tried #4, the all black outfit but it was a fail. The proportions looked OK in the mirror but when I took a photo I could see that they were not at all flattering. DH agreed and the two pair of wide leg jeans I bought a year and a half ago went into the donation bag. Wowowowwwwww love ALL of these!! I hope this kind of pant never goes out of style. I’m with quietgirl. I can’t seem to make wide crop pants work for me. But it’s not wide feet that throw the look off – it’s big feet and (often) walking shoes and socks I don’t even like and the memories of being a skinny kid stuck wearing “floods”. If I have full length pants, either straight or wide pants work OK. In summer, I’ll go with full length pants or put on sandals and go up to capri pants, or wear a skirt. So I’m hoping I can just sit this trend out. Wide crops are tricky for me too. They have to fit narrowly at the hips to make up for my lack of waist to look right to me. But I would love to try #2 in blue. Until that combination shows up, #1 is more likely. It sounds like wide crops are growing in popularity. The eye can adjust to much more than we expect. I’m thinking of a pair of white wide crops in denim, perhaps.